Los Angeles-based architects HansonLA and developers Maxxam Enterprises have unveiled renderings for a pair of eye-catching apartment blocks slated for the Los Angeles Arts District. Together, the two schemes could bring a combined 405 housing units to the booming neighborhood just east of downtown. The first, dubbed 676 Mateo, would bring 185 live-work units and 23,380 square feet of commercial space to a site located at the intersection of Mateo and Sixth Streets. According to the renderings, the complex would be anchored at the corner of the site by a sculptural eight-story tower wrapped in reflective metal skin. The eight-story tower features rounded window openings and is shown supported by a monolithic pier that would allow the ground floor of the site to remain as outdoor space. The covered plaza is capped by a reflective ceiling and would make up part of the project’s 15,000 square feet of open space. It is shown in the renderings flanked by expanses of storefronts. The tower would be joined on the site by a pair of brick-clad apartment blocks that feature more normative configurations, including rectilinear punched openings and projecting balconies. Eleven percent of the units at 676 Mateo will be set aside as affordable homes. A second development—dubbed 1100 E. 5th Street—would be located just a few blocks over and would bring another 220 live-work apartments to the area. Renderings for that project call for an eight-story apartment complex wrapped in square-shaped punched openings and metal paneling. The building will feature projecting triangular balconies and inset rectilinear loggia spaces. The complex will also feature 44,530 square feet of commercial areas as well as 23,000 square feet of open spaces, Urbanize.la reports. Like 676 Mateo, the 1100 E. 5th Street complex will set aside 11 percent of its dwellings as affordable housing. 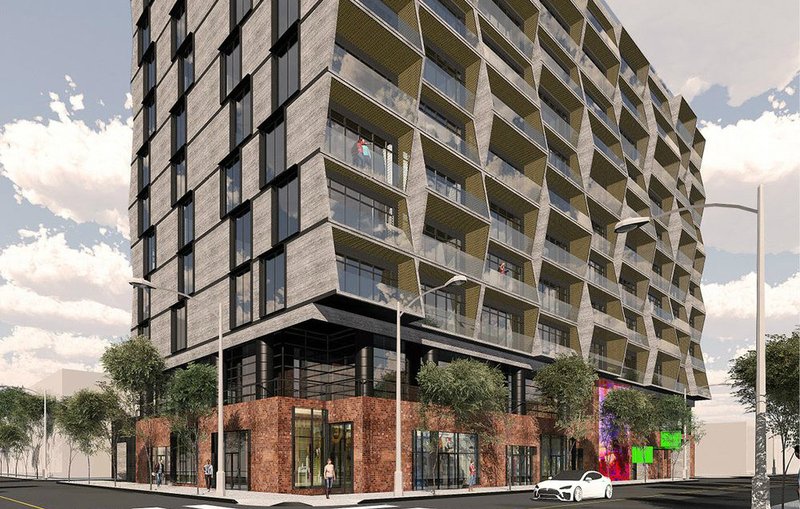 The complexes join a growing list of new, form-forward developments coming to the Arts District, including a 320-unit complex from SteinbergHart and Shimoda Design Group, an angular 12-story tower from Johnson Fain, and a 260-unit gridded complex by BIG. Los Angeles-based architect and educator Peter Zellner has announced that the Free School of Architecture (FSA) would be moving locations. 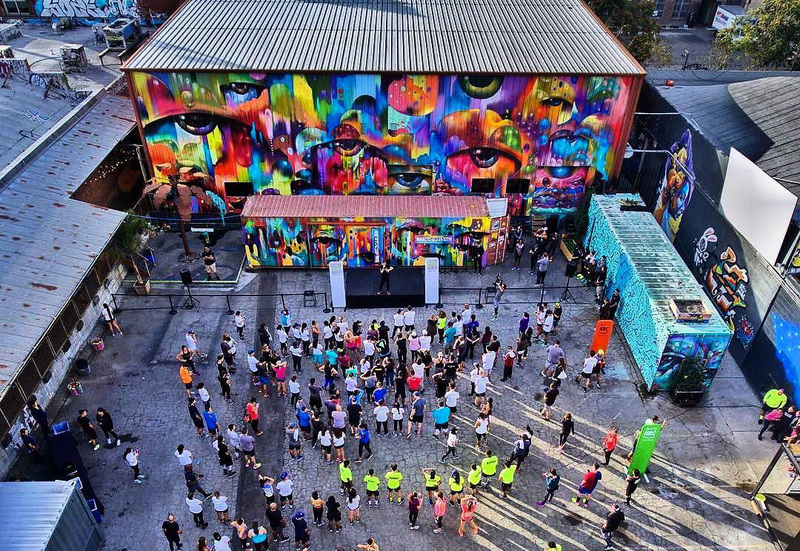 According to a press release from FSA, the school’s inaugural cohort has grown from an original estimate of 20 to more than 70 and as a result, FSA will now hold courses in The Container Yard (TCY), a 60,000-square foot collaborative arts space in Los Angeles’s Arts District neighborhood. FSA was originally scheduled to operate out of the Architecture + Design Museum. In announcing the move, Ash Chan, owner of TCY said, “[TCY] has always represented freedom of creativity and the pursuit of curiosity and knowledge—The opportunity to contribute to the evolution of accessible academia is such an honor.” Zellner added, “We hope [FSA] can contribute to TCY's spirit of public engagement and collaboration. TCY’s substantial indoor and outdoor spaces will allow us to experiment with class, lecture, and workshop setups, creating a model of education that is literally and conceptually open." The move comes as FSA gears up for its inaugural session on June 1st. The school will host an opening symposium titled “FREE” that day, focusing on the “state and future of architectural education.” According to the release, the symposium will explore new forms of education and pedagogy, discuss disciplinary and vocational issues, and address the socio-economics of education, post-digital, and post-studio education. For more information, see the FSA website. 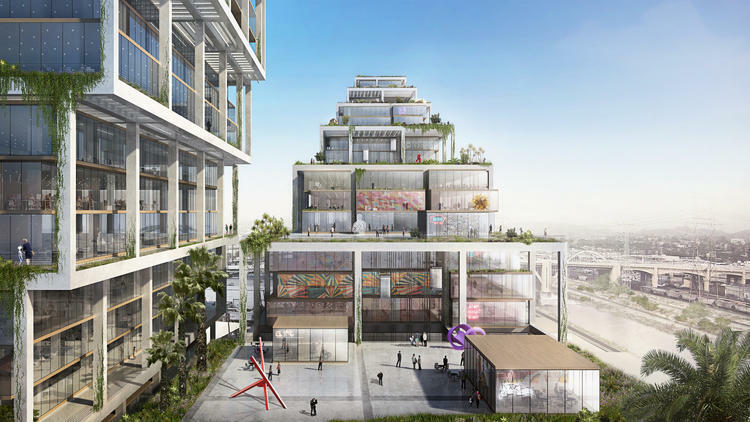 New details revealed for Herzog & de Meuron’s $2 billion development in L.A.
Those holding their breath in anticipation of seeing Herzog & de Meuron’s 6AM project—developed by Irvine, California–based developer SunCal and located in Los Angeles’s booming Arts District neighborhood—anytime soon are in for a long wait. Why? Because according to a preliminary report filed with the Los Angeles City Planning Department (LACPD), the $2 billion development is not expected to be completed until 2035. As reported by Urbanize.LA, the multi-phase project (the firm’s first in Los Angeles) is due to ultimately contain, among other components, a pair of articulated, 58-story housing towers. The project’s initial environmental report indicates that 6AM will function like a small-scale city, complete with a large grocery store, arts spaces, offices, a school, and other diversely-programed amenities, all developed, according to the document, in “a range of building types and heights that are based on the existing building typologies” and crafted from “rough, ‘authentic’ and typical industrial construction materials.” The 2,824,245-square foot complex will ultimately contain a total of 1,305 apartments, 412 hotel rooms, 431 condominium units, 253,514-square-feet of office space, an approximately 29,316-square-foot school, approximately 127,609 square feet of community-serving retail, and 22,429 square feet of art space. 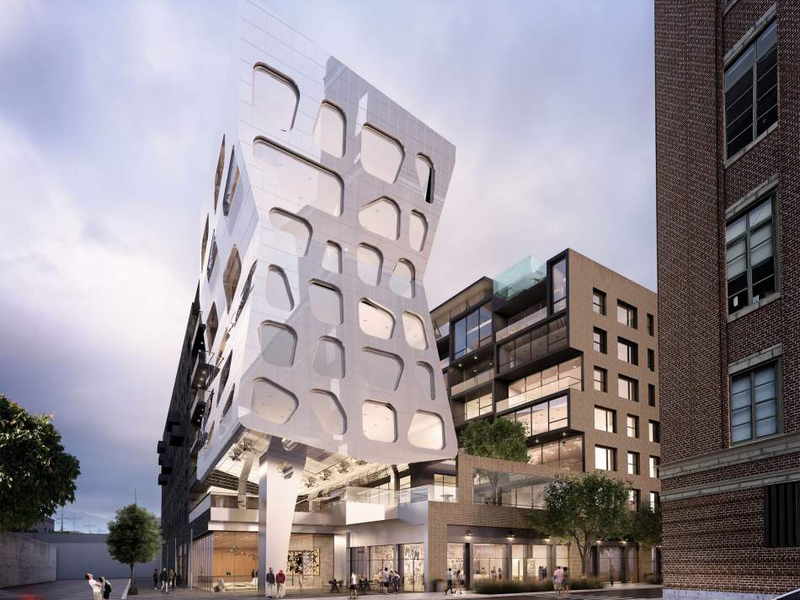 The project will be organized as a porous, mid-rise, mixed-use district on the ground floor, with the arts programs, school, commercial areas, offices and live/work lofts organized in a set of gridded blocks topped by a 40-foot-tall concrete platform. The four-story-tall platform—articulated in renderings that accompany the report by square-shaped, exposed concrete piers—will act as a tabletop for a second layer of program to be located directly above, mainly apartments. Generally speaking, those apartments are to be organized along five of the six linear bands that run from north to south along the short dimension of the 15-acre site. 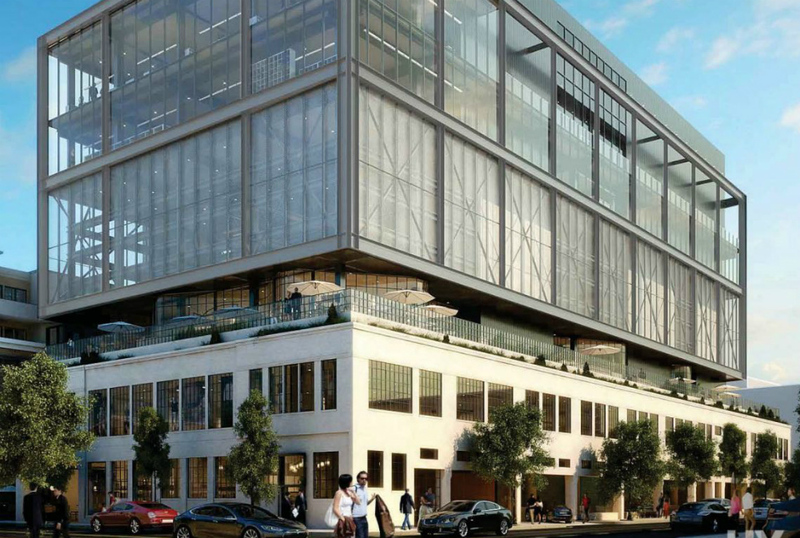 The band closest to the Alameda Street-fronting towers will contain office spaces throughout. The apartment blocks will contain a mix of unit sizes, with a section along Mill Street dedicated to hotel uses. The apartments, like the two towers at the opposite end of the site along Alameda, will look down on the ground floor areas via a series of openings designed into the concrete tabletop structure. Those towers, made up of a bundled set or square floor plates arranged at staggered heights, will rise along Alameda Street beside a potential light rail line to be built to Artesia in southeast Los Angeles. The lowest section of the northern tower is also being designed to contain a hotel. Building 1, located at the corner of 6th and Mill Street will contain a 152-room hotel and 22,429 square feet of arts programming. The 118-foot-tall structure will contain a hotel-focused “amenity deck” along the eighth floor. This building will also contain an undisclosed number of apartment units. Building 2, also 118 feet tall, will contain 245 condominiums atop the platform and approximately 41,852 square feet of retail along the lower levels. It is anticipated that this block will contain the site’s aforementioned grocery store in the lower shopping area, as well as restaurants and live/work units. This block will contain residential amenities at the fourth level and along the rooftop. Building 3 would rise to 110 feet in height and contain 532 apartments above the table top, with 62,966 square feet of retail functions underneath, including potentially, a food market hall, restaurants. The tabletop area is due to contain outdoor amenities, including a swimming pool. The under-table areas are also being designed to contain apartments and up to 21 live/work units. Building 4 will house 251 apartments, 17 live/work units and a 29,316-square-foot school. The planning document indicates the school program may exist in any number of configurations, including as a private or hybrid private/public school and will serve up to 300 K-12 students. Building 5 will rise to 126 feet in height and will contain 253,514-square feet of office uses. Building 6 would rise 58 stories to a maximum height of 732 feet and would include 186 condominiums, 260 hotel rooms and 7,020 square feet of retail that will share the below-table areas with residential and hotel lobby areas. Building 7 will rise to 710 feet in height and will include 522 apartment units and 7,228 square feet of commercial areas. The building is also due to contain a whopping 3,441 parking stalls, as well as 298 short term and 1,889 long-term bicycle parking spaces. Mia Lehrer & Associates will be providing landscape architecture services for the project, while AC Martin will serve as executive architect. 6AM is expected to be built in three phases starting around 2018. The La Kretz Innovation Campus (LKIC), designed by John Friedman Alice Kimm Architects (JFAK), is a new business incubation center in Los Angeles developed by the Department of Water and Power (LADWP), the Community Redevelopment Agency of the City of Los Angeles, and Los Angeles Cleantech Incubator (LACI), a nonprofit tasked to transform the city into a green-collar hub. The 61,000-square-foot “sustainability factory” is located in a collection of single-story, masonry-and-bow-truss warehouses from 1923 in L.A.’s Arts District. The neighborhood, home to the Southern California Institute of Architecture and a growing number of creative industries, is well-suited to benefit from a “Cleantech Corridor” specifically zoned to support the green economy-related development now running through it. The complex, measuring 290- by 200-feet, is carved into eight similarly sized warehouse bays mirrored about a central axis. The eastern four bays are dedicated to business incubation services: office spaces, meeting rooms, and lounge areas. The western half of the building contains maker spaces: state-of-the-art fabrication rooms with robots and wood shop tools. While the exterior of the building has been left mostly untouched, the whole of the structure has been seismically retrofitted and its interiors upgraded with new surfaces and partitions. Upon entering the building, one discovers a waiting lounge demarcated by an abstracted triumphal arch. The area is wrapped on two sides by a luscious indoor green wall while white prisms—actually, light cannons designed to reflect sunlight indoors—descend from the ceiling above the adjacent reception desk. 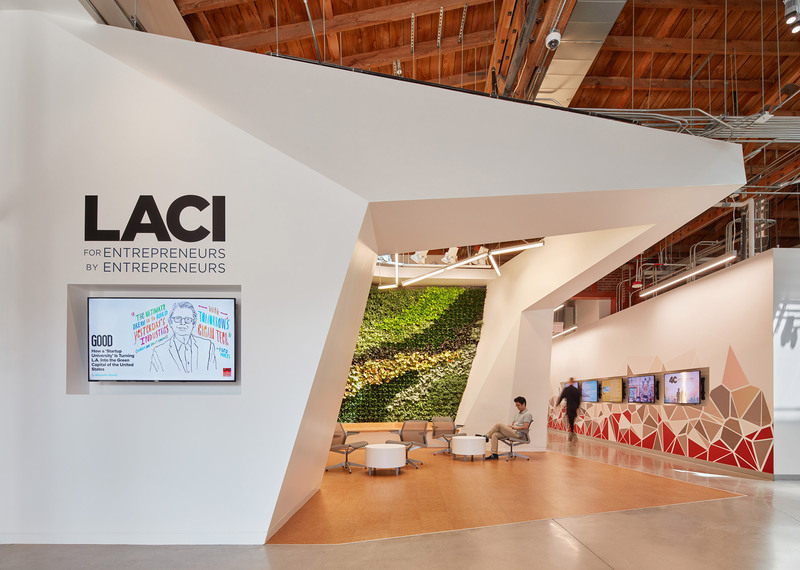 Spaces beyond contain an arrangement of single-height partitions and fully-enclosed meeting rooms, all sandwiched between polished concrete floors and the soaring, lumber arches of the bow-trusses distinctive to L.A.’s industrial architecture. The following bays provide more offices and lead to a semi-formal, wood-paneled amphitheater and cafe lounge. The lounge overlooks the new Arts District Park, designed by staff landscape architects from the Los Angeles Bureau of Engineering with JFAK, who designed a shade structure for it. The half-acre park features a playground and landscaping fed by a gray water–reclamation system designed by LADWP. BuroHappold was the mechanical and sustainability engineer. The western portion of the building contains utilitarian conference rooms, laboratories, and fabrication spaces. Generously proportioned gypsum and glass partition–lined hallways snake along the main party wall at the center of the complex, connecting the business and fabrication spaces along a social core. These routes connect physically discrete spaces, giving the building’s interiors a sense relative impermanence that contrasts with the solid masonry walls and the elaborate truss ceiling above, now bedazzled with all manner of mechanical and electrical systems. Los Angeles–based Bureau Spectacular recently debuted a 2,000-square-foot flagship store for Frankie, a high-end fashion house. The shop, located in L.A.’s Arts District, is a spare box with polished floors and exposed brick walls framing what the firm calls a “super furniture” piece. The exterior is covered in black and white graphics that riff on the early 20th-century structure’s industrial detailing, with framed, jack-arched windows and various downspouts and roll-up doors along the facade painted with diagonal black bands—streaks of extreme shadow. Inside, Bureau Spectacular designed an assembly of functional volumes that can be brought together into one 28-by-10-foot staircase. The firm’s founder Jimenez Lai considers the staircase to be the latest in the firm’s “super furniture” line of works, with the constituent components of the sculptural stair containing clothing racks, dressing rooms, storage bins, and display shelves. Lai described the work as an exploration of composition and part-to-whole relationships, with the interplay between those two aspects of the design being rather literal. Copenhagen and New York City—based Bjarke Ingels Group (BIG) has unveiled plans for a new, L-shaped mixed-use project in L.A.’s aggressively-gentrifying Arts District. The project, first reported by the L.A. Times and called 670 Mesquit, is planned to contain 800,000 square feet of office space, 250 residential units, and two specialty hotels. The project is being developed by Vella Group and will aim to inject an element of public outdoor space into the previously-industrial neighborhood by proposing a large-scale deck connecting the site with the Los Angeles River. The proposed structures and the river are currently separated from one another by a depressed railway interchange along the longest edge of the site. BIG’s proposal is organized within a gridded concrete superstructure running in three directions. Each bay of the superstructure measures 45 feet on each side and contains elements of programming that are intended to be customized by the final tenants as either housing or office space. The size of the frame will allow these users to have a say in how the spaces within are filled in, whether with interior mezzanine levels or fully-built out levels. 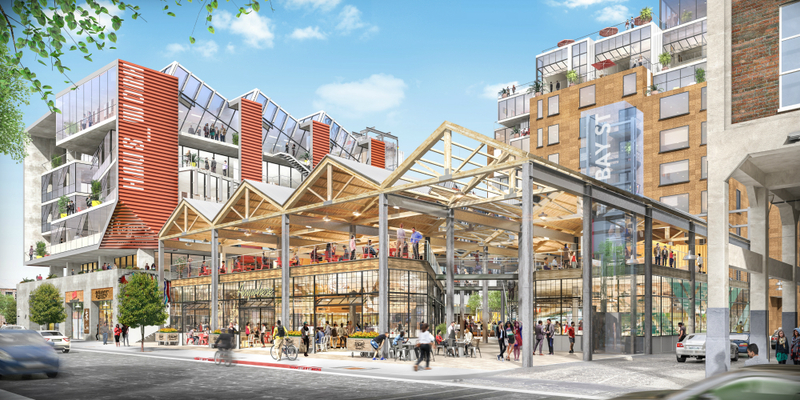 Certain bays in the development are left open and will act as public passageways aimed at connecting the ground floor retail areas with the proposed river-bound walkway, L.A. River, and surrounding neighborhood. When these passages occur in the project, according to renderings released by the firm, they cut through an entire bay each time, effectively creating three separate buildings strung together by the concrete armature. The resulting masses step either out or in, depending on the tower block, forming ziggurat-or Breuer-inspired massings. The development will contain 41 affordable units, roughly 16-percent of the overall total, with the rest being priced at market-rate. 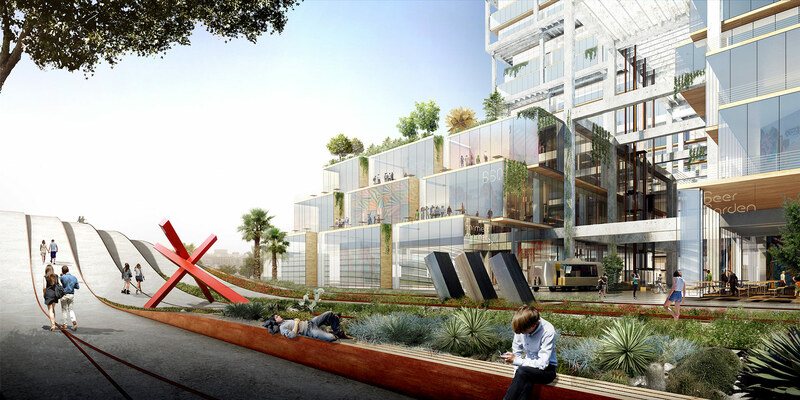 The development marks BIG’s first commission in Los Angeles and is one of a recent crop of California-located schemes that include offices for Google in Northern California with Thomas Heatherwick and a mixed-use complex in San Francisco. Downtown Los Angeles—based Togawa Smith Martin Architects has revealed renderings for a new mural-clad, 12-story multi-family housing tower in L.A.’s Arts District. 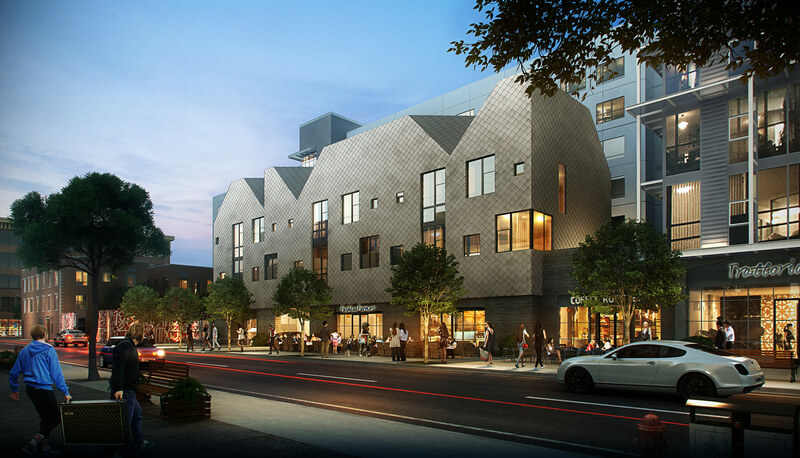 The project, Arts District Center, would contain 129 live-work condominiums, an 113-room “art hotel,” and 70,000 square feet of retail space along the ground floor. The project will include a public “art plaza” at the corner of Fifth and Seaton Streets and include a 10,000-square foot of art gallery and event space plus a 3,000-square foot artist-collaborative space known as “CoLab” meant to incubate aspiring designers and artists. 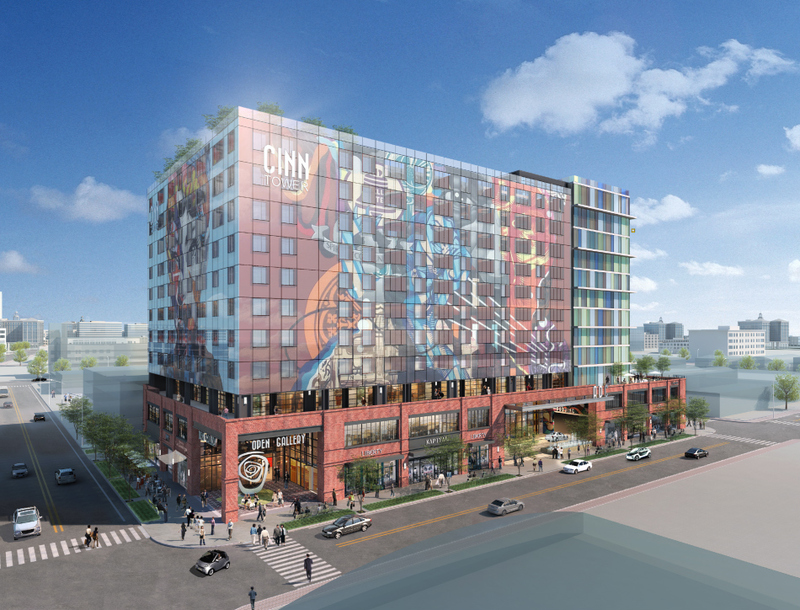 Renderings shown on the firm’s website and the Arts District Center's website depict a rectilinear tower set atop a double-height, brick-clad retail podium with the public art atrium anchoring the building’s commercial spaces to the street at the corner. The tower is set back from the street line in order to accommodate a terrace at the base of the housing component that overlooks the street. The building features neat rows of punched window openings and is clad on at least two sides by an architectural screen wrapped in large-scale murals. The eastern portion of the building is clad in floor-to-ceiling expanses of multi-colored glass and features projecting floorplates. 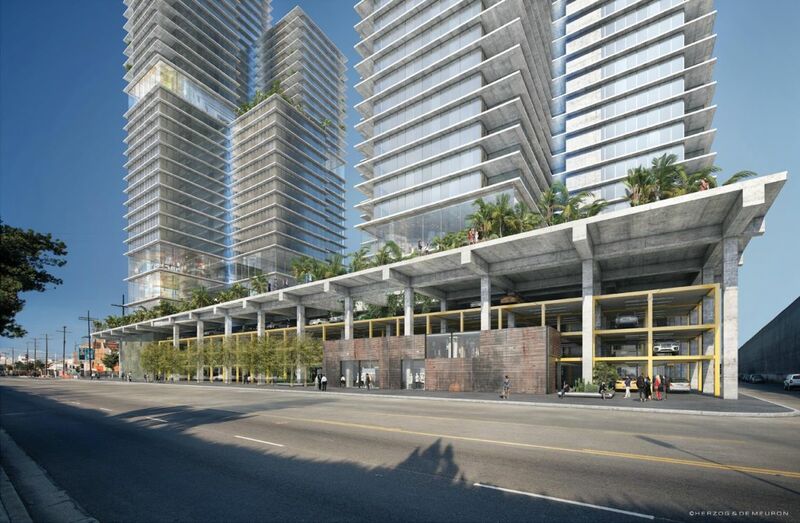 Renderings also depict a large porte-cochère as well as a rooftop terrace. The Arts District Center is the latest in a long line of multi-family residential and mixed-use projects for the booming area on the eastern edge of Downtown Los Angeles and follows high-profile projects like the 6AM project by Swiss architects Herzog & de Meuron and a slew of more modestly-scaled proposals like Studio One Eleven’s 2110 Bay development. For more information on Arts District Center, see the project's website.